Today we have something a little earlier than the normal 5F1 Champs. This is a Fender Champion 600. This is the second version of the Champ and is a step down in speaker size (6 inches) from its predecessor the green tweed Champion 800 (8 inches). The circuit was identical between the two. This is a tv front style (because of its rounded inner corners on the grill cloth and resemblance to televisions of the era) with two tone vinyl covering. The best we can do for estimating the age of this amp is looking at the serial number 744. 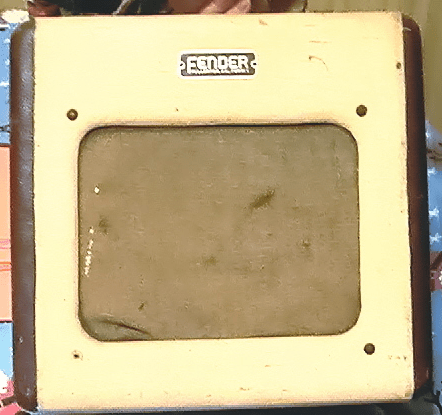 The article by Greg Gagliano on how to date a Fender amp by serial number tells us that this amp was probably made in late 1948 or early 1949. According to Teagle & Sprung the earlier green tweed Champion 800 model was completely phased out and the new two tone vinyl Champion 600 began production in June 1949. We know this is one of the earliest Champion 600s because the owner tells us that the label inside this amp has the 800 crossed out and 600 written in (that’s what you do when you have a big pile of old labels laying around when you make a change and don’t want to waste money by just throwing them away!). This amp has had some work done on it, view the update here.